A week-end of Healing and Restoring Yoga Immersion at the beautiful Sediba Mountain Retreat, Hartbeesportdam, providing an ideal opportunity for reflection and inner contemplation. 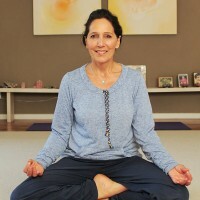 In this peaceful atmosphere Kathy Schwager from Cape Town will guide you on a journey of awareness and self-discovery, in order to go deeper into yourself. Suitable for complete beginners or more advanced practitioners. You meet and experience your body exactly where it is. The cost is R550.00 per person, per day. A deposit of 50% will be required to secure your booking. All proceeds go towards the upkeep and maintenance of Sediba. Limited accommodation is available on request at R300.00 per person, per night self-catering or R400.00 catered. About Kathy : Prashant at Sediba inspired me into the world of yoga in 2000. I qualified at Ananda Kutir Ashram, Cape Town as a Sivananda Level 2 Integral Yoga Teacher. I went on to further my studies by completing a Yoga Nidra Teacher’s Training course given by Swami Pragyamurti of the London Satyananda Centre. My journey then took me to Munger and Rikhiapeeth, in India, where I attended courses on Prana Vidya and Ajapa Dharana at the Bihar School of Yoga. I then rounded out my experience with one year’s mindfulness training with Rob Nairn of the Cape Town Buddhist Center. Over the last 10 years I have taught yoga therapy from my studio in Claremont, on both an individual basis and in group classes. I have held regular group sessions at the Crescent Clinic, working with people suffering from depression, mental conditions, eating disorders and substance abuse, as well as at the Valkenberg Psychiatric Hospital. These experiences have further shown me the positive influence yoga has on mind, body and spirit, and in doing so have provided me with a broader, more hands-on approach as a teacher.The human body is dynamic and versatile and capable of repairing itself. We use yoga as the bridge between mind and body, through the vehicle of the breath, in order to assist the natural healing process.